• The African Aviation Tribune •: ■ SÃO TOMÉ & PRÍNCIPE: Newly installed São Tomé Int'l runway lights sabotaged twice; treachery suspected. Portuguese newswire PNN quotes ENASA managing director, Raúl Cravid, who led an investigative team, as saying the manner in which the cable was cut suggested an act of sabotage. "The cable was simply cut and we think it was sabotage by someone who knew what he was doing . The person pulled the cord and cut it, " he said. Mr Cravid said that in the space of two weeks, two incidents had occurred; the first involving the removal of several runway edge lights ("torn away") which were subsequently replaced, the second involving the failure of a complete row of approach lights on the morning of September 30, just prior to the touchdown of an inbound TAAG Angolan Airlines (DT) B737. He said that in order to improve the security of the airfield's vital equipment, more frequent perimeter patrols would be made, with particular emphasis placed on sensitive electrical infrastructure. 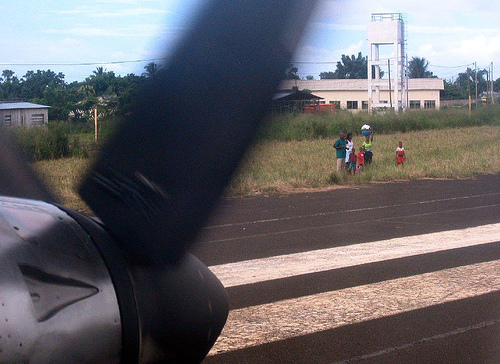 The installation of a runway lighting system was part of a raft of aviation-related projects the São Toméan government has highlighted for attention under its 2013 Budget.